Asia DeMarcos is one of the most sought-after estheticians to the stars in Hollywood. Her clients include Ryan Seacrest, Debbie Gibson, and more. I am so fortunate to be featured on Asia's popular website, Hollywood Beautiful, and named a "Superhero." It is a tremendous honor for me! And she is being kind enough to treat one of you lovelies to a 30 minute skincare consultation and to green skincare from Sophyto! The 30 minute consultation can be either by phone or Skype (Facetime) and the winner will talk directly to Asia about your skin. Asia will give you some great tips on things you can do right at home for your skin. The winner will also receive an organic SOPHYTO product based on their skin type. Choices are the Serum, Moisturizer or Regenerating Skin Mask. Enter now through JUNE 30, 2013 at 11:59 EDT. 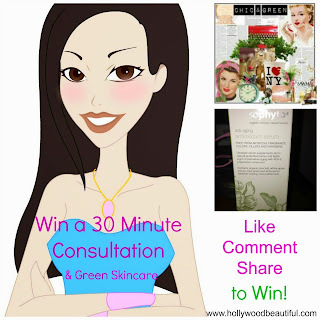 To enter, LIKE Chic & Green on Facebook and Beautasia on Facebook. COMMENT on the pages and share with friends to complete your entry!